The LTMS sensors from B.E.G. Controls reliably detect the three the most important values of a room: They measure the room temperature and the brightness on the ceiling and transmit the measured values to two 0- 10 V interfaces. In addition, the sensors detect movement that is detected via a switching contact is signalled. All this information can be then for closed (proprietary) BUS systems (e.g. LON or PLC) and DALI systems can be used. All you have to do is find the right input module for the 0-10 V output of the multi-sensor in the system must exist. The detectors are connected to a 12-48 V supply. The sensors cover a wide spectrum in all three measuring ranges: The temperature can be measured from 0 to 50 °C, making the sensor extremely versatile. Motion detection is possible at an angle of 360° and a range of 29, 33 or 79 feet in diameter at an mounting height of 8 feet. The brightness sensor measures a spectrum of 0 - 1000 lux. Output values can be set directly on the device. The FLAT sensor impresses with its low-profile design. With an extremely low surface height of only 0.85 mm in ceilings, it is practically invisible, making it perfectly suited to properties with high architectural standards. With an area of about 4800 sqft, the CONNECT is ideally suited for very large rooms. 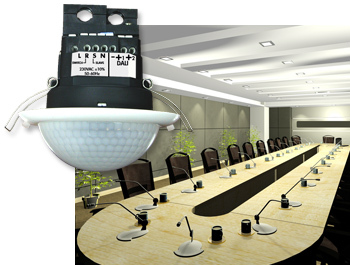 The CIRCLE from the LTMS series, for example, is ideal for use in offices.